A delightful holiday decor piece to enjoy year after year. RAZ Imports water lantern measures 11 inches X 4 inches X 4 inches. 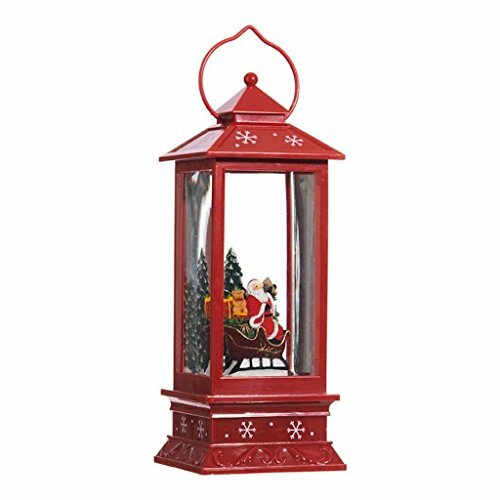 Snow globe lantern is made of sturdy plastic with red finish. Continuous swirling glitter shines in this lighted snow globe lantern. Requires 3 AA batteries to operate holiday snow globe lantern (not included). Includes 6 hour on, 18 hour off timer. RAZ Imports water lantern measures 11 inches X 4 inches X 4 inches. Snow globe lantern is made of sturdy plastic with red finish. Continuous swirling glitter shines in this lighted snow globe lantern. Requires 3 AA batteries to operate holiday snow globe lantern (not included). Includes 6 hour on, 18 hour off timer.